With a focus on design, materials, and longevity, Campaign Living is telling IKEA, and their peers in the direct-to-consumer seating space, to have a seat. On a related note, I was wrong. This campaign starts with an American steel frame, wrapped in the sustainable fabric of your choice, and filled with memory foam. Campaign’s furniture isn’t modular in the sense that you can add more seating on a whim, but the fabric covers and legs are designed as part of an ecosystem to be swapped in and out in the future. 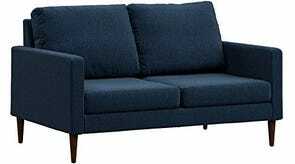 I checked out a sofa in vintage blue merino weave with mahogany stain legs (duh all around). There are no chaise or ottoman options (yet), and no optional integration of features like wireless charging. If you want to stump for Campaign, you’ll need to prepare accordingly, as Amazon clocks the shipping weight of the sofa in at ~150 pounds. American steel baby. Sitting on memory foam is very different than sitting on standard couch cushions. While support and durability go way up, you’ll be taken aback at the lack of loftiness the first time you plop. The fabric repels liquid and vacuums off easily. 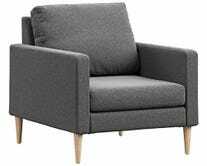 A sofa is going for $1095 after applying a coupon on Amazon as I write this, while our recent exclusive discount brought Burrow’s three seater down to $995. Obviously there’s no limit in either direction to furniture pricing, but this is all to say that Campaign’s focus on quality hasn’t caused them to ring up much higher than the competitive set. The last time I bought a couch I looked at more than 4000 options, and now even the direct-to-consumer furniture space is filling up. Campaign is priced competitively and built to outlast you, with more careful thought put in to each design element and material than pretty much anyone else out there. We’re psyched to watch their catalog get filled out. I also got my arms around Campaign’s vegan leather pillows, which are absolutely glorious. I’ve never liked a throw pillow before, and I’ll be first in line when Campaign wraps the rest of their furniture in this stuff.